Cheesecake can seem like an intimidating project to a beginning baker, but it's not hard to learn how to make strawberry cheesecake. The flavor of fresh berries and the thick, dense texture of cheesecake are a natural pair, so berry cheesecakes are perennial favorites. You'll make your cheesecake in three steps: the crust, the cheesecake filling, and the strawberries. If you don't have a food processor, you can also crush the cookies yourself and mix the ingredients for the cheesecake with an electric beater or stand mixer. Remember to wash the food processor between making the crust and filling. In a food processor fitted with a chopping blade, pulse the cookies for 15 to 20 one-second pulses, until the cookies are finely ground. Add the butter, sugar, and salt. Pulse for 5 to 10 one-second pulses until the mixture resembles wet sand in texture. Press the mixture into the bottom of the pre-greased springform pan. In the food processor, combine all ingredients. Blend on high until smooth. Carefully pour over the crust in the springform pan. Place the springform pan on a rimmed cookie sheet and put it in the preheated oven. Bake until the cheesecake is set in the center, about 70 minutes. Cool on a wire rack for one hour. Transfer to the refrigerator and chill for at least four hours. Run a knife around the edge of the springform pan and release the cheesecake. In a large bowl, combine the strawberries, sugar, and lemon juice. Mix well and allow to rest in the refrigerator for at least 30 minutes. Meanwhile, bring the jam to a simmer in a small saucepan on medium-high heat. Cook for three minutes, stirring constantly. Stir into the strawberry mixture. Cool completely before spreading on the cheesecake. 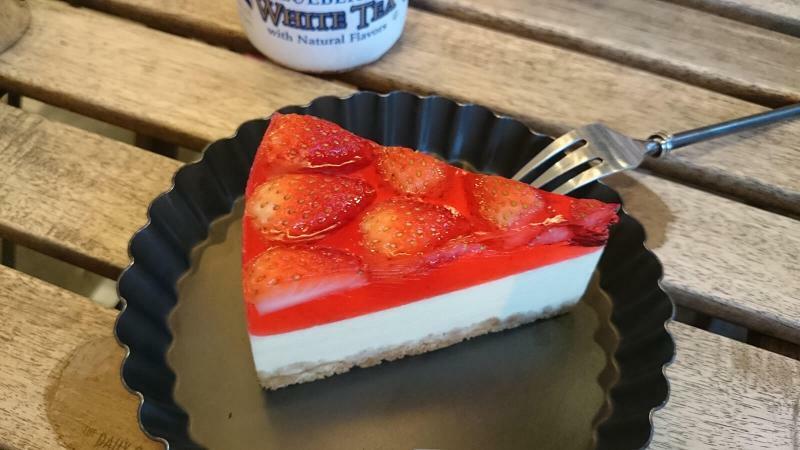 For a less sweet topping, omit the jam and instead spread the strawberry, sugar, and lemon juice mixture on the cheesecake or simply top it with fresh strawberries tossed with a teaspoon of lemon juice. Make the perfect cheesecake with the following tips. To save time, use a pre-made graham-cracker or other cheesecake crust. Instead of using fresh berries, use frozen. Double down on berry flavor by making the cheesecake with strawberry-flavored cream cheese in place of the plain cream cheese. Don't overbake the cheesecake. It may crack if it becomes too dry. To help prevent cracking, let the cheesecake cool in the oven (turned off) for several hours after it's done baking. Top the cake with a variety of fresh berries such as blueberries, blackberries, and raspberries, and drizzle them all with the macerated strawberry glaze. Garnish each slice of cheesecake with a chocolate-covered strawberry. Strawberry cheesecake takes several hours from mixing bowl to dessert plate, but most of the time is passive as you wait for it to bake or cool. The result is worth the effort however, because you'll wind up with a tasty dessert.